PokerNews caught up with Hoyt Corkins, winner of the $2,500 No-Limit 6-handed event to talk about his 2nd bracelet win -- his first was FIFTEEN years ago. Click here to check out the interview with Hoyt, along with all the other videos from this event. Hand #83 - Terrence Chan has the button, he raises, Corkins moves all in, and Chan thinks for a few minutes before he calls with . Corkins shows , and Chan will need his hand to hold up to stay alive. The flop comes , and Chan retains the lead. The turn card is the -- ! Corkins turns a pair of kings to take the lead, and Chan needs an ace on the river to survive. 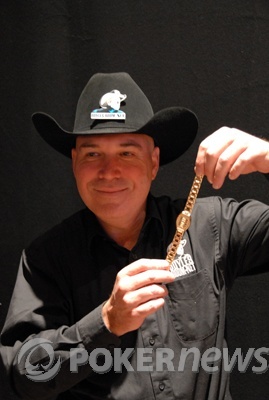 The river card is the , and Hoyt Corkins wins the hand -- and the bracelet -- with two pair, kings and eights. Terrence Chan is eliminated in second place, earning $287,345. Hoyt Corkins wins Event #30 ($2,500 No-Limit Hold'em 6-Handed), earning $515,065, a Corum watch, and the second WSOP bracelet of his career. Corkins won his first bracelet 15 years ago (1992) in $5,000 pot-limit Omaha -- that's a long time to go between bracelets. Of course, Corkins has done quite well for himself in the meantime, with a WPT victory and over $2.7 million in career tournament winnings. This victory takes him over the $3 million mark. Hand #81 - Terrence Chan has the button, he raises with , and Corkins folds . Hand #78 - Hoyt Corkins has the button, he raises with , and Chan folds . Hand #77 - Terrence Chan has the button, he raises to 75,000 with , and Corkins folds.